The de Comarmond house in Cameron Village, a modernist renovation. 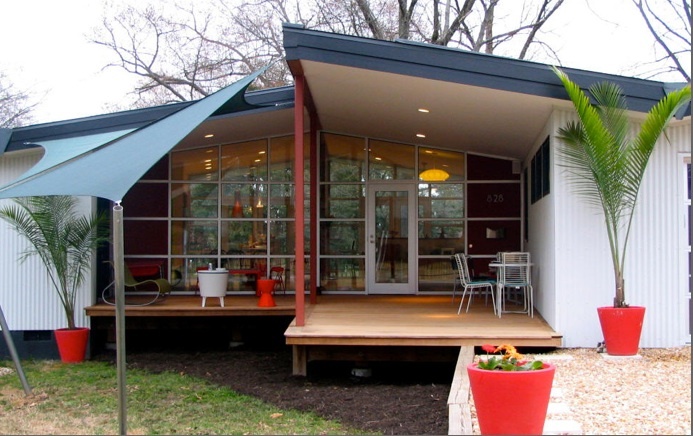 Triangle Modernist Houses’ Raleigh Tour features eight plus one iconic office building. June 15, 2010 (RALEIGH, NC) – Triangle Modernist Houses today unveiled the eight architecturally remarkable homes and one commercial space that comprise the “TMH Modern 2010,” the non-profit organization’s 13th home tour, on Saturday, September 25, from 1- 430 p.m. in Raleigh. – The Milton Small House on Lake Boone Trail, designed by Milton Small, FAIA, and built by Frank Walser. – The Laurent P. de Comarmond, AIA, Modernist house renovation on Graham Street in Cameron Village. – The Parker House, designed by Carter Williams, FAIA, on Banbury Road, renovation design by Perry Cox. – The Karmous-Edwards House, Runnymede Road, designed by Frank Harmon, FAIA. – The Heather and Bo Taylor House, Graham Street in Cameron Village, designed and built by Will Alphin. – The Jim Kuehn Residence, located on Fairall Street, designed by Brian Shawcroft, AIA. – The Ron Collier House, on Manning Drive, designed by architect/owner Ron Collier, AIA. – The Harwell Hamilton Harris, FAIA, home and office on Cox Avenue, designed by Harwell Hamilton Harris, FAIA. As an added attraction, the TMH Modern 2010 will also include a tour of the Milton Small Office Building on Hillsborough Street, designed by Milton Small, FAIA, and built by Frank Walser. The Small Office Building is a designated Raleigh Historic Landmark and frequently studied by students at NC State’s College of Design. It is strikingly similar to Small’s house, also on the tour. Photography is allowed and encouraged inside and outside all the buildings. Proceeds benefit TMH’s ongoing Modernist documentation, preservation, and promotion programs. Sponsors for the TMH Modern 2010 include Preservation North Carolina, Beyond Blue Interiors, Modern Homes Network, the Cameron Art Museum, Tonic Design + Build, Earp & Associates, The North Carolina Symphony, Nowell’s Contemporary Furniture, Eidolon Design, Center Studio Architecture, Ambiente International, Historic Charlotte, the Gregg Museum of Art & Design, Quail Ridge Books & Music, and Architecture for Humanity. Companies can still sign on as sponsors by contacting George Smart at 919-740-8407. For more information on Triangle Modernist Houses and more details on the fall tour, visit www.trianglemodernisthouses.com.